Fuad Ramses (Mal Arnold) runs a grocery store and deli that caters to the rich and bored. He specializes in authentic ancient Egyptian cuisine and brutal mutilation. Ramses murders beautiful young women and takes a different body part from each of them to make a sort of sacrificial mulligan stew. 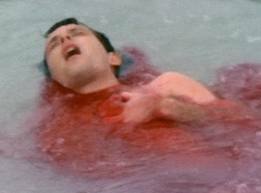 Soon, Florida’s beautiful sunshine-riddled lifestyle is all bloody. The headlines are filled with stories of murder victims and people are starting to notice. Well, some of the people are. The murders pale in comparison to the important issues in this film. Namely, will Suzette be surprised at her party? The whole time the killer is butchering helpless victims, society matron, Mrs. Fremont (Lyn Bolton) is planning a big party for her daughter, Suzette (Connie Mason). It should be a gas, since they’ve hired Fuad Ramses to cater. Blood Feast broke new ground for violence in 1963. Made in four days for $24,000, the film angered or disgusted a lot of people. It also sold a lot of tickets. Director, Herschell Gordon Lewis generated buzz around the film by issuing vomit bags to filmgoers. He even served an injunction against theatres in Sarasota, Florida to prevent the showing of Blood Feast, which, of course, drummed up business considerably. According to imdb, Blood Feast made $4 million in the US. It’s no Hitchcock thriller, but at least Lewis accompanies the unrealistic gore with wooden acting and unnatural dialogue. At one point, Mrs. Fremont reads her lines off a sheet of paper sitting on the sofa beside her. Classic. Ramses continues his violent spree, taking pleasure in eviscerating his victims and caressing, then stealing their innards. The only hint to his motive comes from an Egyptology class Suzette and her boyfriend, Detective Thornton, both take. Ramses may be following a recipe from his own book, Ancient Weird Religious Rites. Isn’t that a great title? Crazy must make you strong, because, despite his small stature and a severe limp, Ramses pushes a strong healthy woman onto a bed and pulls out her tongue. Apparently, she didn’t fight back because she didn’t need it anyway. Later, in the hospital, she manages to describe her assailant articulately to Detective Thornton using her auxiliary tongue. 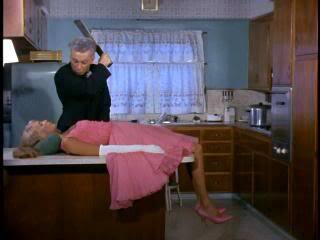 Lewis directed mostly nudie films before Blood Feast, but jumped into the slasher genre with both feet. 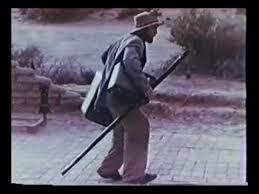 The first film in the Blood Trilogy, Blood Feast preceded Two Thousand Maniacs! 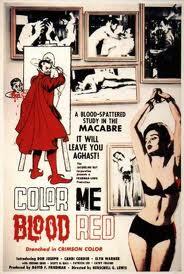 (1964) and Color Me Blood Red (1965). Blood Feast is a gory film, even when weighed against today’s slashers. Ramses holds a severed leg and a tongue and manhandles assorted internal organs. He also whips a young girl ecstatically. This pretty much say it all. Blood Feast entertains accidentally. It’s fun to guess which organ Ramses will collect from each murdered woman and the acting is stiff and stilted. Mrs. Fremont and Suzette are attractive, but no competition for Meryl Streep, or her gardener. Then there’s the soundtrack. Cool organ music from couples’ skate night at the roller rink plays while Ramses stalks and kills women for parts. After the dramatic rescue, the police chase Ramses to the landfill, where he jumps in the back of a trash truck and gets squashed. A rocket crash lands on Earth and a helicopter flies out to check for survivors. 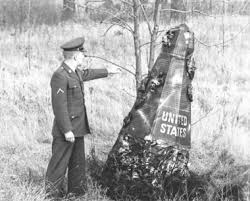 When the brass arrive, they find the burned, too-small-to-hold-a-human rocket with no astronaut in sight and a dead helicopter pilot. Oh well. They go back to the lab so they can stand around awkwardly and a narrator says things. That’s pretty much Act One. Later, a bunch of forty-something college students dance at a boring party. That’s the a-go-go part. A couple leave the party to go neck and a creature with a pituitary problem and a bad oatmeal masque attack them. The narrator says more things. That’s the monster part. 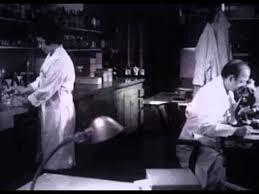 Now, we’re in a lab manned by quasi-Annette Funicello and an accountant wearing Groucho glasses. They discuss radioactivity and office politics. After Annette leaves, Groucho does sneaky stuff with the antidote she just made and the narrator tells us this scientist is hiding the monster. Groucho goes out for a sandwich and when he comes back, he finds the lab has been destroyed. The narrator lets us know this is the monster’s doing and soon Groucho is getting a good talking to by his boss, Colonel Somebody. He meant well though so they kiss and make up. The monster runs amok again and I lose the will to live. That’s Act Two, I guess. You could cut the tension with a knife. Stuff and things and running. Anyway, they corner the creature in a sewer. Do sewers have corners? They’re just about to grab him when…absolutely nothing happens. You’re not surprised because the film has established that pattern already. The End. What can I say about Monster-a Go Go? Hmm…Herschell Gordon Lewis didn’t want credit for it. A military guy in one scene has no insignia. Budget issues? Another high-level conference scene looks like it’s taking place in a laundromat. Good call, @FanForumsTV ! Oh, the music! The music sounds like it’s being performed, on found instruments, by Yoko Ono’s less talented cousin. In one scene, you can hear someone making a ring sound with his mouth before the guy picks up the phone. I’m not kidding. Actors stand around awkwardly waiting for each other to talk and I swear one guy’s cue cards were on the floor. No one in the film can act and the plot doesn’t move forward…or sideways…or even backwards. It just lies there like a slug waiting to be salted. If it weren’t for Captain Exposition (the narrator) you’d never know what anyone was doing or why. Actually, you still don’t, but at least he doesn’t mumble like the rest of the cast who sound like they’re talking into a tin pail full of mashed potatoes. At least the cinematography holds up. Just kidding. Bill Rebane directed this muck and The Giant Spider Invasion. Yep. 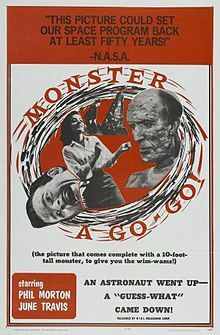 Monster-a Go Go came out a year after The Creeping Terror which set the bar so low you’d think it would take the trophy for crappy, poorly-acted films with too much narration, but no. Monster-a Go Go wins. Painful. Nasty, selfish artist Adam Sorg (Gordon Oas-Heim) scolds his girlfriend, yells at critics, and insults patrons of the prestigious Farnsworth Gallery. Everyone agrees Sorg could use a personality transplant, but they put up with his petulance because of his enormous talent. Yep. Despite his obvious painting chops, Sorg can’t sell a painting. Why? According to the beret-clad art critic who intelligently sits in a chair facing away from the art, Sorg uses color wrong or doesn’t use enough color or something with color. After a weird water bike chase with his girl because they had two water bikes and director Herschell Gordon Lewis needed a tax deduction on them or something, Sorg agrees with his critics and realizes he needs a new color. His girlfriend (Elyn Warner) accidentally cuts her hand and bleeds on some discarded canvas et voilá! Sorg has it! 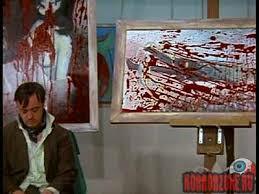 He’ll use Gigi’s blood to liven up his latest painting. He squeezes Gigi’s cut finger onto the canvas until she tells him to use his own damn blood and takes off. Gigi returns to find Sorg passed out on the couch covered in his own blood. Since he can’t keep cutting himself and painting until he loses consciousness, he simplifies things and kills Gigi and uses her head as a paintbrush. Problem solved. He buries her on the beach directly in front of his house under about six inches of sand because he’s an artistic genius, but not exactly a criminal mastermind. He brings the Gigi-spattered painting to the gallery and, wait for it, everyone loves it! Yay! The gallery’s one customer offers to buy it, but Sorg refuses and rushes out. I may not know art, but I know what I like. Sorg kills more people. A couple take his water bikes for a joy ride which doesn’t end well and there’s a fascinating scene in which he squeezes his victim’s entrails into a bowl for later use. What a waste of paint. As the body count rises, so does Sorg’s status in the art world. Offers for his paintings reach dizzying heights. 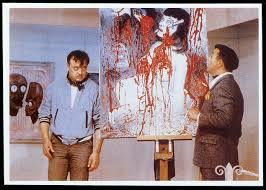 The Customer offers $15,000 for Sorg’s chef-d’oeuvre, a painting with a lot of red in it. He declines to sell once again which puzzles the customer and the critic, who apparently lives in the chair at the gallery and never changes his clothes. Soon we meet the customer’s daughter, April, her boyfriend, Vanilla Guy, and this couple they’re friends with who wear matching clothes and are wacky and fun and you want to kill almost immediately. After some stilted dialogue, April, Vanilla Guy, and the Obnoxious Twins go to the beach. Sorg sees April and can tell by looking at her that her blood has the Pantone seal of approval, so he lures her to his studio by DA DA DUM…asking her to come over. April, whose hairstyle deserves separate billing, and her bathing suit by Depends, visit the elegant, wood-paneled studio/living room of our hero. Sorg then puts April in a series of poses involving ropes and pulleys as he sketches her and handles his axe. Get your minds out of the gutter. Anyway, the Obnoxious Twins discover Gigi’s crab-covered body on the beach. Really. They remember they came with a fourth so Vanilla Guy goes into Sorg’s house which is about three feet away. He walks in to find his girlfriend tied to the ceiling wearing a bathing suit with her back turned to a man wielding an axe. Just stand there so I can kill you. He does what any red-blooded American 34, ah 21 year-old guy would do. He stands completely still and asks where the phone is. 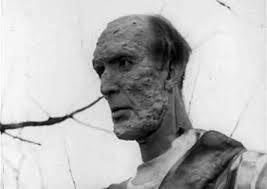 Herschell Gordon Lewis wrote and directed Color Me Blood Red along with the other two films in his Blood Trilogy; Blood Feast (1963) and Two Thousand Maniacs! (1964). The sound quality never quite achieves junior high AV club quality and one can assume the actors were hired because of some blackmail plot. I still enjoyed the film as a whole. I didn’t know exactly what would happen and I got to see Sorg squeeze guts, emote, and ride a water bike. Similar to A Bucket of Blood, but without the production quality and sympathetic hero, Color Me Blood Red strikes me as more of an outsider’s film. Lewis didn’t care if you liked his hero. He wanted to tell his twisted tale so he did. He had water bikes so he threw them in. He thought up this screwy couple so he threw them in too. Aquanet was cheap so he used it…a lot of it…on April. He had his hero use a woman’s head as a paint brush. Need I say more? I think not.